A) What does the last text you sent say? And to whom? I'm on the platform and no trains in sight. Color me chilled and very late. To one of my coworkers on Thursday morning. B) What does the last text you received say? And from whom? Then go get a hot chocolate. Nothing much going on here. From that same coworker on Thursday morning. D) Are you afraid of walking alone at night? Depends on where I am and whether or not I'm alone. I don't like to let fear dominate me, but I don't want to be foolish, either. E) What do you do to relax at the end of a stressful day? Go off in search of alone time. I find that being quiet and cuddling a cat does wonders. F) Where did your last kiss take place and with whom? I got kissed a lot at Christmastime. Not since then. Lots of hugs, no kisses. G) Do/did you get into trouble a lot at school? No. I was a good kid. H) Do you enjoy your job? If unemployed, are you content being so? I'm a writer and I enjoy writing. Sometimes I hate my job, but I usually enjoy the task at hand. I) Do you often pick up on double entendres and innuendos? Yes. J) Have you ever been offered drugs but declined? Yes. K) Have you ever met someone who has completely altered your way of thinking? Yes. L) Have you ever been offered drugs and accepted? Yes. M) Tell us something weird that turns you on. Really old TV shows. 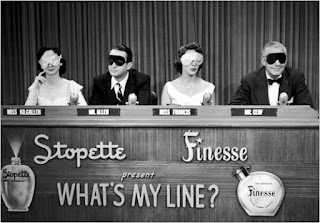 Lately I've been hypnotized by episodes of What's My Line? from 1960 or so. I am fascinated to see America in this sleepy time, before the assassinations and Vietnam war and riots and protests. N) When did someone last admit romantic or sexual feelings for you? Was the feeling mutual? God, it was 100 years ago. But yes, it was reciprocal. O) What is something you have given a lot of thought to lately? That I don't understand how people can actually vote for a crass bully like Donald Trump. My uncle suffered from Parkinson's Disease so this cuts very close to the bone. That Serge Kovaleski can do his job while battling a congenital condition should be applauded, not mocked. Ugly, ugly, ugly. I can't believe people applauded this. 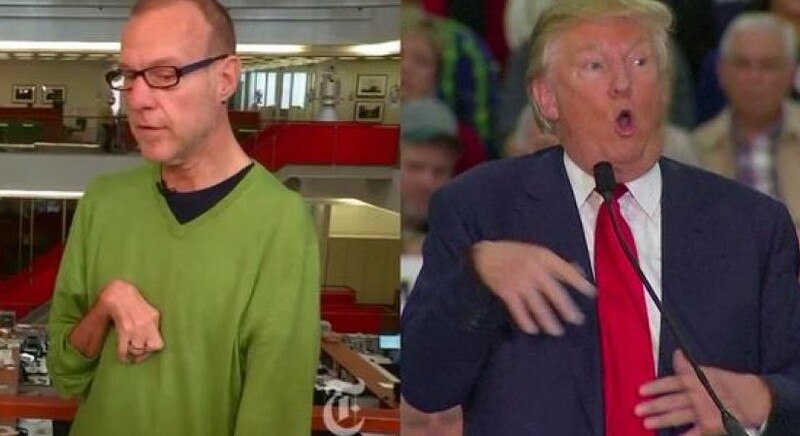 I can't believe people voted for him. P) When did you last swallow your beliefs to avoid an argument or confrontation? Not that often. I try to stay true to myself. Q) Do you usually initiate hugs? No. R) Are you a very affectionate person? Perhaps not. S) Can you roll your own cigarettes? No. I try to literally never touch tobacco because it, literally, stinks. T) What are you looking forward to? Cubs and Braves tomorrow. U) Do you have any tattoos. Do you want any/more? No, and no. V) Are you mentally strong? Less so with time. W) Are you physically strong? WAAAAY less so with time. X) Do you think you’re a good person? I know I am, and I try to be better all the time. Y) Name one thing you wish you could change about your life right now. My chins. I'd like to see fewer. Z) What do you usually eat for breakfast? Milk and an apple. Something else to worry about! 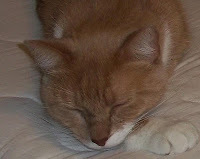 First I lost my dear old cat, Joey. Then I got the disappointing -- though not imminently fatal -- news about sweet little Connie. Today was Reynaldo's turn at the vet. He was very agitated before we even left the house. I attributed this to his having to fast -- no food after midnight because he was having bloodwork done. He was angry in the car, which surprised me because travel has never bothered him before. While waiting our turn in the vet's waiting room, he started to chill and so I took him out of the carrier. He was tense, of course. His entire body felt like one lean, taut muscle in my arms. But that was because of all the new views and smells. When a woman came in with a poodle mix -- a rather old dog with a bloody paw -- I decided to put Rey back in the carrier. He was fine with the dog, but the dog, who was already in some degree of discomfort, seemed way too interested in him and I was afraid something sudden and claw-driven might go down. So I put Rey back in the carrier. At which time he hissed at me. He hissed at me! This has never happened in our 12 years together! And that, folks, was only the beginning. In the waiting room, the veterinary assistant got a loud purr when he put Rey on the scale. (The skinny beige demon weighs just over 7 lbs. ; same as last year and the year before.) Rey merrily flipped back and forth on the table like a fish on the bottom of a boat, giving the assistant two sides to pet. I thought the whole exam would go well. Reynaldo, who lets me do whatever I wish to him whenever I wish to do it, suddenly took umbrage. How dare the vet open his mouth and check his teeth! This procedure was met by wrigglings and low gutteral mutterings. Then came the vaccinations. Rey has been getting shots, without hardly noticing, for more than a decade now. This morning he acted as though an evil knight was running a sabre through him. They took him back to draw blood and after a few minutes, the vet assistant came back empty handed. "He really doesn't like this," the assistant said, taking Rey's carrier back with him, thinking it would be a good way to both restrain and comfort him. When the vet himself brought Reynaldo back, he was covered in beige fur. "Fire. Cracker." Those were his words as he placed the carrier in my hands. We chatted for a few minutes, more about Connie than about Reynaldo. He's a very nice man, new to the practice, and very sensitive to my concerns. He reiterated that Connie is fine right now, and with careful care she can remain fine for a long time to come. He says that Reynaldo's vitals are all strong, his eyes and teeth and gums look good, and we have no reason to believe that his bad behavior was do to any more than Rey being, "hangry." I'm not so sure. This aggressive and angry behavior is not like my little man. Active, yes. Hell, manic is his customary mode. But not angry. I hope it doesn't mean that something is wrong. I wish it didn't take 48 hours to get bloodwork back! Let's revisit this post from two weeks ago: As I was settling our bill at the front desk, one of the vet techs -- the one who actually drew Connie's blood -- came over to tell me what a sweet and special little girl she is. Finding a usable vein was a little harder and took a little longer than was customary, but during the process Connie maintained eye contact with the tech and kept on purring. "I thought, 'this is one I want to take home!'" the tech enthused about my gentle and trusting girl. The tech remained invisible and in the back room as I was settling Reynaldo's bill. 1) This song begins by mentioning clouds. Do you see clouds in the sky this fine Saturday? It's gray and rainy. The Cub game was called. BOO! 2) Lead singer Zac Barnett sings that, "Everything is looking up." What are you looking forward to today? Well, I was looking forward to the Cub game. But since it's raining, I'm kind of at loose ends. Oh well, I like days that just unfold naturally. 3) 2016 is not yet half over, but what's been your best day so far this year? That's hard, because this has been a crappy year so far. I think the day when I met the new specialist who gave me a solid treatment plan was a good, hopeful day. 4) The members of the group, American Authors, met in college. When is the last time you heard from a school chum? Do you know them from grammar school, high school or college? I'm in almost constant touch with my oldest friend, whom I've known since Kindergarten. 5) One of the all-time best-selling American authors is romance writer Danielle Steele. She's been writing for more than 40 years and has sold more than 800 million books. Have you read any of her work? Nope. But I think about a decade ago I watched a marathon of her books made into TV movies. The aforementioned friend from Kindergarten was going through a tough time, and we laid in a supply of pizza and ice cream and had a sleepover while watching soapy chick-flicks on the Hallmark channel. 6) Have you ever dreamed of being an author? Yes. But I lack the discipline for the rewrites. 7) Do you have an e-reader? Yes, a Kindle Fire. But I seldom use it. 8) American Authors rang in 2016 in Chicago, giving an outdoor concert on New Year's Eve on a stage not far from Lake Michigan. There are 5 Great Lakes in all,including Lake Michigan. Without looking it up, name the other 4. I learned this in school as HOMES. But since Michigan is a gimme, it's just HOES. (There's a set-up line for Bud if ever there was one.) H=Huron, O=Ontario, E-Erie, S=Superior. 9) Random question: You see photos on Facebook of a dinner party hosted by a friend. You recognize most of the attendees, yet you weren't invited. How do you feel? Left out and angry? Do you wonder what you may have done to offend your friend? Or do you just forget about it and move on? I wouldn't care. Maybe they live out in the burbs and it would be too hard for me to get there. Or maybe it was all couples and they didn't think a singleton like me would have fun. If the host/hostess were truly a friend of mine, I'm sure I'd understand the situation and not be disturbed at all. A "Friday 5" about movies.